This tutorial will review the process of editing the information on your account in Drupal. To do so, you need to log into your website as a normal user and then click on the My Account button at the top-right corner. Current Password - You need to enter the current password if you wish to change the email address or apply a new password on the account. Email address - Change the email address. 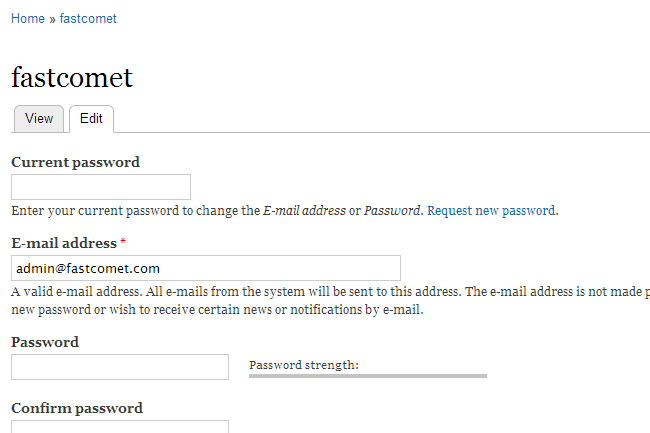 Password - Enter a new password if you wish to change it. Confirm Password - Enter the new password twice for verification. Picture - Upload a picture for the account. Locale Settings - Choose a timezone.